From the world media reports dedicated to the situation on the Korean Peninsula, the wrong impression might be given, that the source of the “world evil”, which is presented as the DPRK, is opposed by the military-political alliance composed of the United States, Japan, and the Republic of Korea. In recent times, in point of fact, Japanese Self-Defense Forces have been associated with large US-South Korean military exercises. However, this does not mean that the 20-year old American dream of forging the above mentioned alliance has finally come true, despite the fact that the USA is in an allied relationship with Japan and the ROK. As for relations between Japan and the ROK, here the reason for Washington’s headache is of the exact opposite nature: it’s tried but so far failed to turn these relations into if not alliance then at least something good neighborhood-like. Periodically, the Japanese ambassador is “temporarily” recalled from Seoul. And even when he is in the capital of the ROK, the official faces of the country do not communicate with him for many months. The main reason for the difficulties in the political sphere of relations between Japan and the ROK can be defined by the elastic word ‘history’, which today is represented by two relatively fresh fragments. The discourse is over the ownership of two uninhabited islands of Dokdo (total area less than 0.2 sq km), located approximately in the middle of the Sea of Japan and the so-called problem of ‘comfort women’, discussed more than once in NEO. The origin date of the first fragment is considered to be 1905 (when before landing in Korea, Japan captured these islands), the second was formed in the late 20’s and early 30’s of the last century, that is, during the Japanese occupation of the Korean peninsula. However, in the author’s view, the fundamental reason for the difficulties in Japan-South Korea relations (and mutual animosity between the Japanese and Koreans) is ‘buried’ much deeper in time. The islands of Dokdo (which in Japan are called Takeshima) today de facto belong to the ROK, apparently, by the power of the 1946 decree by the commander of the occupying forces in the territory of Japan, General D. MacArthur. In turn, Japan can refer to the fact that these islands are not in the list of the territories whose possession it renounced under the San Francisco Peace Treaty. Be that as it may, but every demonstrative act of the ROK, designed to emphasize its ownership of the Dokdo Islands, uniformly provokes an official protest from Tokyo. It was in 2012, when the then President of the ROK landed on the islands (which was the reason for the ‘temporary’ recall of the Japanese ambassador). It happened at the end of December 2017, when the ROK held two-day naval exercises in the region of the same islands. At the same time, the second fragment once again made itself known in recent history. On November 24, the South Korean parliament legalized the commemoration day (August 14) for ‘comfort women’, which caused the expectedly negative reaction from the head of the government of Japan, Yoshihide Suga, who stated that this act is contradictory to the December 2015 bilateral agreement. Japan associates the ‘final and irreversible’ solution to the problem of ‘comfort women’ with this document. In order to find some compromise on this issue, the Minister of Foreign Affairs of the ROK, Kang Kyung-wha, on December 19 held a meeting in Tokyo with his Japanese counterpart, Taro Kono. Apparently, without any results, as T. Kono insisted on the ‘implementation’ of the provisions of the agreement with South Korea. 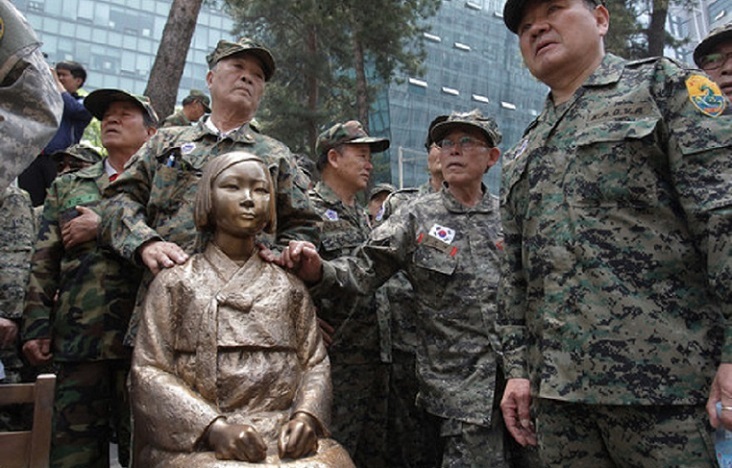 The response of the ROK was boiled down to the statement of the representative of the Ministry of Foreign Affairs of the country on December 26 about the existence of a ‘secret appendix’ to said Agreement, where the ‘finality and irreversibility’ of the solution to the problem of ‘comfort women’ is stated (allegedly) in writing. However, it was clear even back then, two years ago, that such document existed: it sufficed to listen to the rhetoric of Fumio Kishida, Foreign Minister of Japan at that time. Whatever it was, but at the end of 2017 both fragments of recent history of Japan-South Korea relations have worked in resonance mode. At the time of writing this article, its consequences include the (allegedly already taken) decisions to ignore Prime Minister of Japan Shinzo Abe at the opening ceremony of the Winter Olympic Games in the ROK and the next ‘temporary’ recall of the Japanese ambassador. Let us remind you that the last time the ambassador of Japan was recalled from Seoul (and also ‘temporarily’) only a year ago. Difficulties in the political sphere of Japan-South Korea relations cannot affect the economic sphere, which at first glance, looks good. With the total volume of bilateral trade in 2016 at $70 billion dollars, Japan is the third largest trading partner of the ROK. This, of course, is not the $200 billion dollars of China-South Korea trade, but it is quite similar to the trade turnover between the ROK and the USA (around $100 billion). The negative influence of political turmoil in Japan-South Korea relations is manifested, first of all, in the long stall in the process of negotiations on the conclusion of the agreement on free trade (Free Trade Agreement, FTA) in bilateral and tripartite (with the participation of the PRC) formats, which, considering that the number of FTA partners of the ROK is already estimated at several dozens, is quite telling. So far, even the extremely serious motive for regional economic cooperation, conditioned by the tendency towards protectionism in economic sphere of the new American administration, is not helping. Finally, it should be noted that the situation forming on the Korean peninsula as a whole, and in Japan-South Korea relations in particular, develops according to the scenario of a good crime movie: what is happening in reality is not what can be observed in the picture formed by the world propaganda machine.